Just the other day I escaped the 100°+ temperature here in Texas by indulging in some Cold Stone Creamery goodness, when I noticed a new flavor: Butterscotch JELL-O Pudding Ice Cream. I loved Jell-O butterscotch pudding as a kid and haven't had it in a long time, so I ordered it without hesitation (I added white chocolate chips and caramel, btw). It lived up to my expectations. It really tasted just like I remember the Jell-O pudding tasting. Today I came across an article about this new Jell-O Pudding Ice Cream at Cold Stone in Invention and Technology News, of all places. 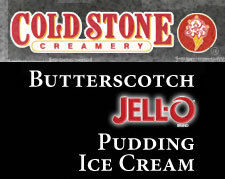 Turns out the new Jell-O Pudding Ice Cream flavors at Cold Stone Creamery is something quite new and unique.... it doesn't melt like regular ice cream, it just turns into pudding. Developed through rigorous testing and tasting, this line of entirely new ice cream flavors has been achieved to not only taste like pudding, but also mimic the characteristics and texture that is recognized as JELL-O pudding yet in a frozen form. The most interesting and surprising feature of this new ice cream is that it does not melt. When left at room temperature this ice cream actually turns into pudding – now that’s ice cream innovation. It also comes in a chocolate flavor. Although this isn't exactly 'fast food' I just had to share.